CORNELIA GUST: Graduate of architecture and interior design in Düsseldorf, sang in a children's choir, the school choir Cologne-Deutz, the church choir Cologne-Deutz. After that she joined the a cappella ensemble "Das Chörchen" in Cologne, which was at first 30 people strong and later 6 to 8 people. In 1995, she became a member of the "joint venture" "Jazz by 5". 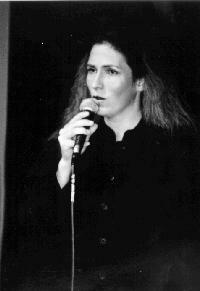 Conny was born in Cologne / likes classical music, jazz, swing, old a cappella music (Hildegard von Bingen, etc. ), depending on her mood or the hour of the day / likes to eat fish and vegetable dishes / is a fan of Ella Fitzgerald and Bobby McFerrin / likes sports, art and her children / often sings the seventh instead of the sixth!